The 2017 edition of the IAAF World Relay Championships whiich is set to hold in Nassau, Bahamas for the 3rd consecutive time will kick off tomorrow, April 22nd at the Thomas Robinson stadium and Nigeria will only be represented by her women’s team which consists of a handful of foreign based athletes as most home based athletes have one issue or the other. Speaking on the situation, Athletic Federation of Nigeria (AFN) Technical Director, Navy Comm. Omatseye Nesiama gave concrete explanations about the latest development. 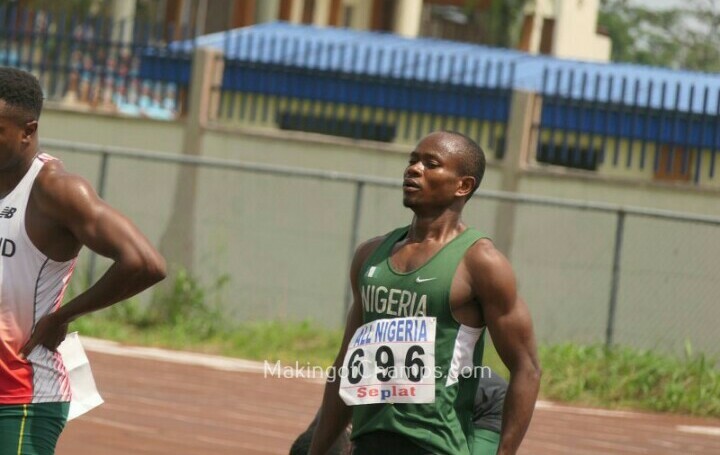 Akure based athletes; Folasade Abugan and Omolara Omotosho will not be on the team reason being that they haven’t competed this year and AFN is not sure of the current form. “Look! This World Relays thing now, there are many things that are affecting it. Sade Abugan and Omolara Omotosho, their current form need to be properly checked. It’s not about going there, in the 4x200m we have the record so if we are going there we should go and put up a good show and even some of the athletes are not reachable. The home based have some issues with visa and not knowing their current form because we had a competition where everybody was suppose to come. So if you were not there, then you are suspicious and that you’re not really ready for the season” he said. National Festival champion, Peace Uko who is also listed for the 4x100m relay will not make the trip as a reliable confirmed to Athletic Heat that she’s still in the country. 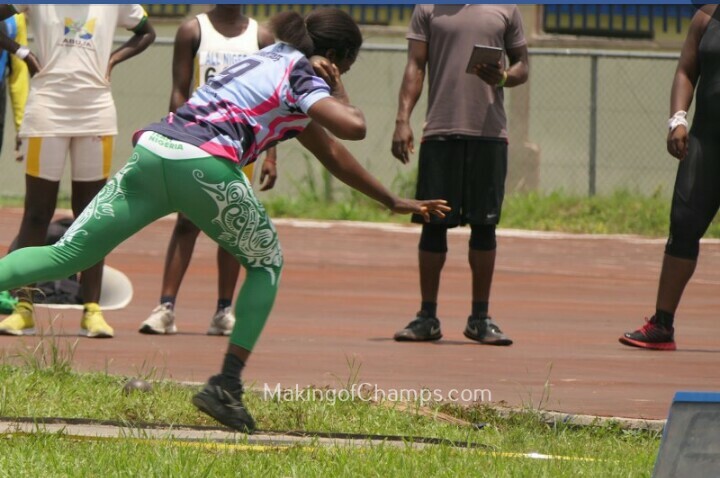 The last home based athlete on the team is National 400m Junior champion, Praise Idamadudu who the Director could not speak on but as at the time of filing, she was seen with her teammate’s of the University of Port Harcourt on their way to Markudi, Benue state for the Nigerian University Games Association (NUGA) competition. 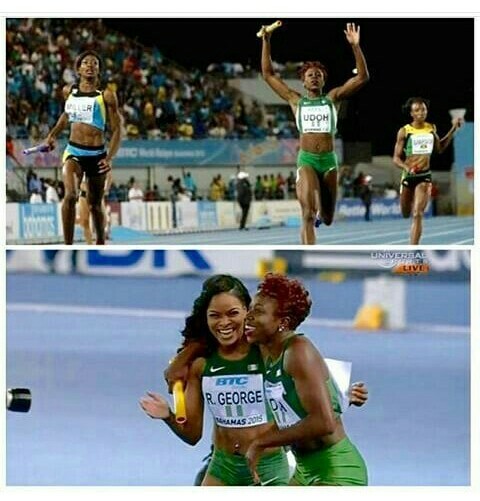 Regina George and Christy Udo after winning the 4x200m at 2015 World Relays. Be that as it may, the tentative list would now be; Blessing Okagbare, Duncan Dominque, Jennifer Madu and Stephanie Kalu for the 4x100m. Okagbare, Duncan and Madu will join Patience Okon for the 4x200m wherein Nigeria is the defending champion in the event while Patience will team up with Jennifer Edobi, Margaret Bamgbose and Ugonna Ndu for the 4x400m event. If these four strong athletes; Abugan, Omolara, Ntai-Obong and Idamadudu are not on the team it means the same athletes that run in the 4x200m and 4x400m heats would run the finals as well without substitutions. That was the same scenario at the 2015 World Championships in Beijing when the women’s 4x400m which included Patience Okon, Tosin Adeloye, Regina George and Funke Oladoye surprisingly beat the Jamaican team to win their semifinal to run a then Season’s Best (SB) of 3:23.27s but in the final, they could only manage a 5th place running 2s slower than they did in the semifinal. “I am not excited but we dont have anything to say, other countries have reserve but it’s the same people that ran yesterday (the semis) that ran today (the final) but other countries like Jamaica, US, Russua, Canada they have their reserve and it’s those reserve that joined those people that ran today to perforn very well” Tosin Adeloye speaking in a post race interview after their 5th place finish. It might be the same story this year but we only hope for the best as the final eight countries in the 4x100m and 4x400m will automatically qualify for the World Championships in London by August. This is one of the problems that the incoming AFN board should look into because if there was adequate preparation all these issues won’t be happening. Good luck to the ladies! Abuja – Earlier today, April 14th 2017 the Minister of Youth and Sports Solomon Dalung held a one-day stakeholder’s forum with Presidents of Sports Federations on national sports federations’ election guidelines at the Media Center, Package ‘A’ at the National Stadium, Abuja. He also laid emphasis concerning the rumors that the ministry had vested interest and candidates. “I use this opportunity, therefore to reiterate what I have always stated in the past- I do not have any candidate in these elections and therefore, have no vested interest in who becomes a member of the new boards. He went on to state that any current Federation president who is also serving as a member of any international sports body is not eligible to contest in the forthcoming election. 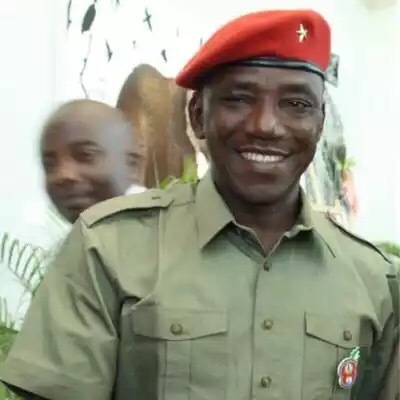 Dalung didn’t mince words when he said that it’s time for fresh ideas, new brains and vibrant leadership in the 25 sports federations in the country. “If anyone intend to aspire for political office in any of the federations, he or she must go and start lobbying the delegates now because nobody can come here and bamboozle me with any letter claiming he I’d a government nominee. That era has passed, he said”. 1.3​ The elections will be conducted by the respective National Sports Federations, with the Federal Ministry of Youth & Sports (FMYSD) or the National Olympic Committee (NOC) acting as election monitors. iiii) One (1) or two (2) Representative(s) of International Sports body of the Sport. Where there are more than two Nigerians serving in such International sports bodies, the one with the highest rank shall be nominated to fill the slots. Where two or more persons are on the same level at international sports bodies, the one with higher number years of membership of such body shall be nominated into the Board of the National Sports Federation. viii) One (1) Representative of the Technical Bodies of the Sport. ii) not be less than thirty (30) and not more than eighty (80) years of age as at the date of the election, except in the case of Athletes’ Representative who may be below 30 but not less than 21 years of age as at the time of the election. Athletes’ Representative shall in addition be an active athlete or have retired not more than four years prior to the election. Such athlete must have also represented Nigeria in at least two major international competitions and with no drug related infraction. viii) have a manifesto detailing the vision and plan as well as the strategies for the attainment of such plan towards the uplift ment and advancement of the sport. The manifesto shall be made available to all electorates at least twenty-four (24) hours prior to the elections. i) who are occupying the post of president or vice President of an international sport body shall no contest for the post of president or vice President of a National Sports Federation. ii) who have served two (2) consecutive terms as President of their National Sports Federation shall not contest for the post of President of that federation. 4.1​ Each NSF shall set up National Electoral Committee of not more than 5 members to conduct the National Election. The members of the Board of each NF as presently constituted shall not serve as member of the Electoral Committee. 4.2​ Each NSF shall set up Electoral committee in each zone to conduct the Zonal election. The Zonal Coordinator shall coordinate all the elections at the Zonal levels. iii) Reserve the right to postpone any election/s if there is proof of violation of any part of the Election Guidelines. ii) There shall be no voting by proxy at any of the elections (Zonal and National). iii) No candidate shall be voted for in absentia. iiii) Zonal Elections shall be held at the respective Zonal Headquarters of the FMY&SD. All Zonal elections shall hold simultaneously. v) The Chairman or a Representative of State Sports Associations in each Zone shall constitute the electorate for the zonal elections in their respective sports. vi) The Board Members Designate from the different constituencies shall form the electorates at the National level. vii) Elections for the positions of President and Vice President of the respective NSFs shall be held in Abuja. viii) All national elections shall hold simultaneously. ix) For an election to be valid, not less than two-third (2/3) of the total number of the electorate must be present and vote. x) Winners shall be decided by a simple majority of the votes cast. xiii) All contestants must sign an undertaking to abide by this Guideline and accept the decision/s of the Electoral Committee. i) The Chairman of an Electoral Committee shall announce the results of Election immediately after the conclusion of the elections. ii) Electronic copies of the results of Elections at the Zonal level shall reach the Chairman of the Electoral Committee at the National level within three (3) hours of conclusion of the elections. The duly signed copy of the results on the Federation’s letter-headed paper shall be forwarded to reach the Chairman of the Electoral Committee at the National level within 48 hours of the conclusion of the election. 7.1.​ In the case of dissatisfaction with any aspect of the conduct and/or result of the elections, a candidate may seek redress by submitting a written Petition to an Elections Petition Committee which shall be set up by the concerned National Sports Federation. 7.2.​ The Ministry of Youth & Sports shall immediately inaugurate a 7 -member Electoral Appeals Committee as indicated below to consider and decide on all appeals arising from the decision/s of the Elections Petition Committee/s. The Committee shall be headed by the Legal Adviser/Head of Legal of the Ministry. 7.4​ Aggrieved contestants reserve the right to appeal to the Appeal Committee. i) Such appeal shall be in writing and addressed to the Chairman of the Appeal Committee, to reach him/her not later than 48 hours after the announcement of the results of the election against which he/she is appealing. ii) All appeals shall be submitted with a non-refundable fee of N50,000.00 (Fifty thousand Naira) only at the zonal level and N100,000.00 (One hundred thousand Naira) only at the national level. iii) Appellants who are not satisfied with the decision of the Electoral Appeal Committee shall appeal against such decision to the Court of Arbitration for Sports (CAS) with the applicable fees. v) In the event of the nullification of an election result arising from the decision of the Appeal Committee, there shall be a bye-election within one (1) week of the decision. 7 Hearing of Petitions and Appeals on Zonal Elections and Constituencies’ Representatives. Murfreesboro, Tenn. – Following an impressive indoor season, Nigeria’s 2015 National 800m champion Abike Egbeniyi has brought the same momentum to the outdoor season. 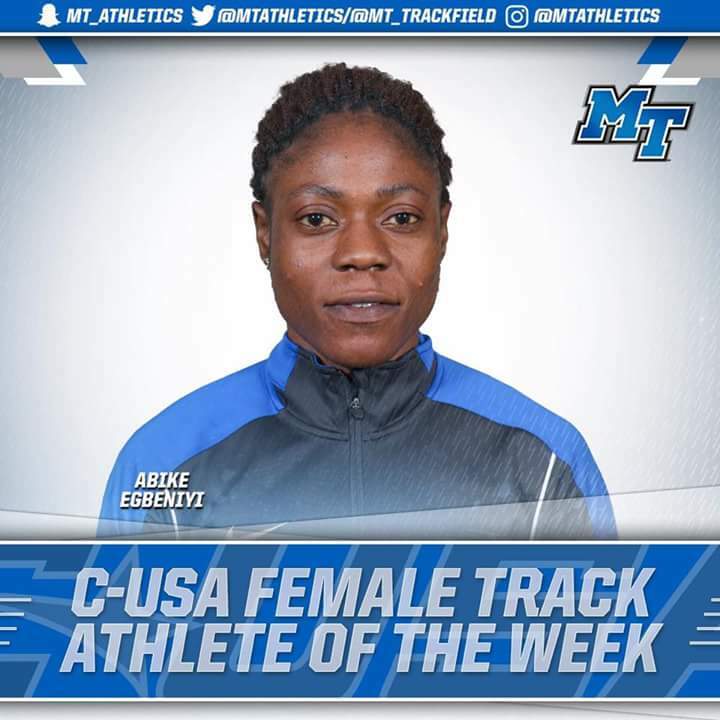 Abike who is a third year student at Middle Tennessee State University in US on Tuesday, April 11th was named the Female Track Athlete of the week for her scintilating performance at the Tennessee Relays last Thursday. Egbeniyi inspired a 1-2 finish for her school running an Outdoor Personal Best of 2:05.43s while teammate Abu Agnes followed closely in 2:05.73s. This is her second win of the season after clinching the 800m title at the Tennessee Rust Buster on March 25th where she posted a time of 2:07.18ss. According to her school’s website goblueraiders.com her time ranks first among C-USA in the 800m and is the ninth-best time in the US this year. At the meet Janet Amponsah, Agnes Abu, Loveth Odia and Abike broke their school 4x400m record for the second time this season to finish second in 3:35.76s. It is worthy to note that this is the second time Abike is receiving this honour after been named Co-Female Track Athlete of the Week on March 28, 2017 for clocking a time of 2:07.18s which ranked second-best time in the country at that time. It was her first outdoor weekly award and she shared the recognition with compatriot, Amusan Tobi of University of Texas El Paso. Well done Abike, the best is yet to come! Port Harcourt, Rivers – The 2017 Nigerian athletic season got underway yesterday, April 12th at the University of Port Harcourt sports centre where the Athletics Federation of Nigeria (AFN) organized the All Comers competition. Atinaya Daniel of Delta State was one of the star athlete of the day as he led from start-to-finish stopping the clock in 47.29s to win his heat in the men’s 400m which was the fastest of all heats. Prior to the one lap race, he competed in the 100m qualifying round where he ran a time of 10.79s to take heat 3. Shedrack Akpeki of Cross River had the second best-time winning his heat in 48.39s ahead of Prosper Ogbonna who posted a time of 48.51s to finish third overall. Athlete to watch out for this season, Harry Chukwudike. Harry Chukwudike of NSCDC thrilled the crowd in the men’s 100m winning in a time of 10.48s bettering his 10.72s in the heat. 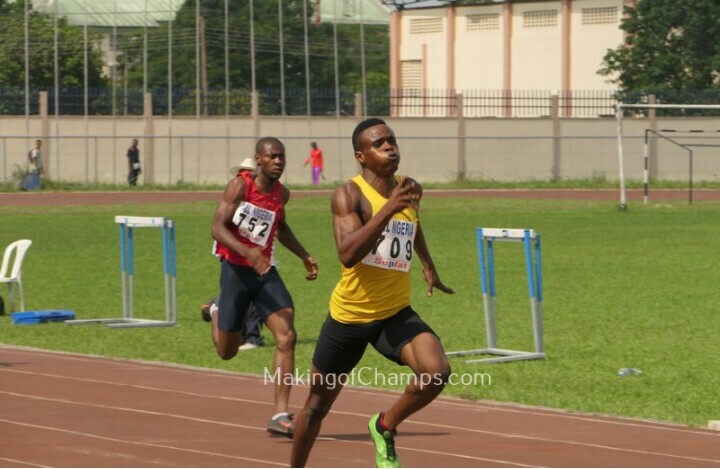 Favourite, Arowolo Emmanuel settled for second in 10.53s while Chukwudi Olisakwe was third in 10.58s. It’s worthy to note that Harry at Zone D preliminaries of NUGA stormed to a time of 9.9h in the 100m. Delta’s Praise Idamadudu comfortably won the women’s 400m in a time of 54.51s. Tracy Idugboe was second in 57.82s while Comfort James finished third in 58.63s. Women’s 100m final won Mercy Ntai-Obong (middle). 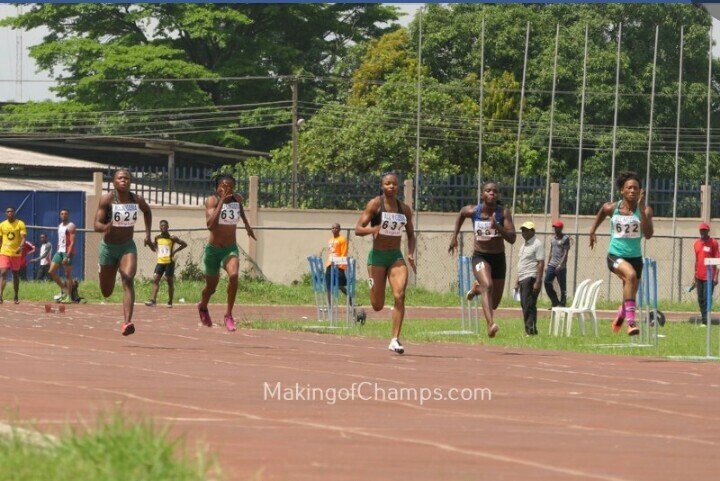 Mercy Ntia-Obong took the 100m women’s title in 11.70s. Lawal Rashidat followed in 11.81s while Adiakherewa Blessing was third in 12.00s. There were only 20 sticks available for the hurdles and so two athletes competed in each heat of the men’s 110m/400m hurdles and the women’s 100m/400m hurdles. Only two ladies competed in the women’s sprint hurdles which was won by Ayemoba Grace in 14.26s while Isa Esther of Eaglesight followed in 15.88s. The men’s 110mh had about 6 heats and Ojiekere Precious had the best time of 14.06s. Abejoye Oyeniyi followed closely in 14.07s while Osadolor Samuel was third overall in 14.76s. Abasiono Akpan had the fastest time of 63.96s in the women’s 400m hurdles. Delta’s Clifford Fego was second in 66.89s and Emmanuel Faith was third in 70.01s. National Junior champion Emoghene Timothy comfortably won his heat with 53.78s to return the fastest time in the men’s event. Prior Ochonogor posted a time of 55.14s while Kufre Samuel was third in 55.92s. In the 800m men, Akwa Ibom’s Eddiong Okon clocked a time of 2:00.82s to take the win. Faith Monday was second in 2:04.55s while Okpala Stanley was third in 2:06.86s. Genesis Barnabas of Kids &Play won the men’s 3000m in 9:52.73s while Abasi-Ibianake Sunday won the women’s event in 11:00.42s. Away from the track, Ogbukwo Eucharia won the women’s Shot Put with a distance of 14.62s. Aniefuna Anulieka was second in 12.60m while Michael Gift finished third in 12.35m. Junior sensation, Princess Kara won the Women’s Discuss in 44.78m. Ugeh Kasie and Anulieka were second and tbits with 36.78m and 25.84m respectively. Top 3 in the women’s Javelin were Francesca Chukwu (40.84m), Mercy Honesty (40.03m) and Ugeh Kasie (38.85m). Olajide Abiola caught the attention of the crowd with his prolific jumps and it was no surprise when he won the men’s Triple Jump in 15.82m. Nzube Ihezue (15.44m) and Meyiwa Ine (15.16m) were second and third redpectively. Mercy Honesty won the women’s Triple Jump in 12.62m while Clifford Fego was second in 11.33m. Lone star’s Oluwayemi Blessing took the victory in the men’s Long Jump with a leap of 7.26m. Okpara Theddus was second in 7.04m while David Kingston was third (7.04m). Marian Thompson of Cross River jumped a mark of 5.90m to win the women’s event. Odiphri Victory followed in 5.64m and HIT’s Kome Okolosi was third (5.52m). It’s a commendable performance from the athletes and it can only get better! 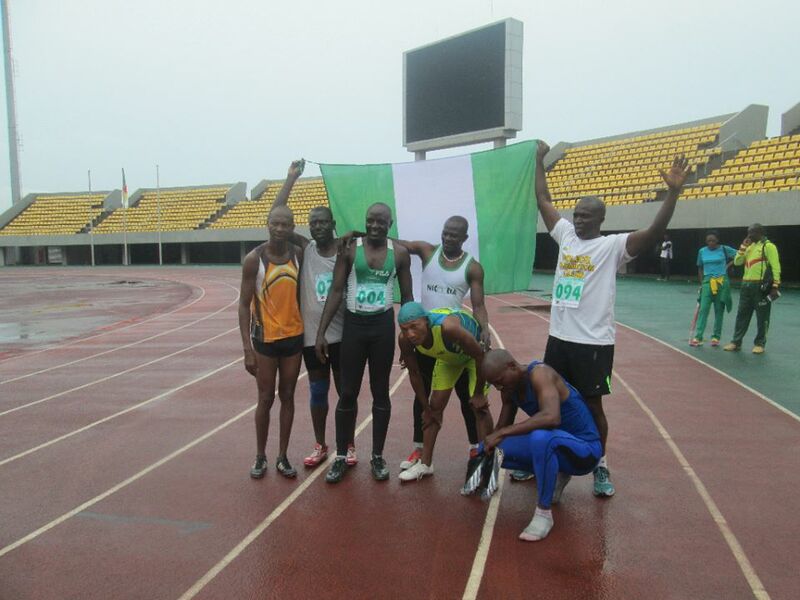 The first AFN competition is set to hold on Wednesday, April 12th and athletes from all over the country will convege at the CAA High Performance Center, Uniport for The All Comers meet. Athletic Heat has come up with a list of hotels around the University for athletes and officials who may not have anywhere to stay. Address: No. 1 Odums street, East West Road Choba. Single room without AC – N3,000. Single room with AC -N4,000. Direction: From Odums junction, you take a cab going into Abuja Campus. Address: No 2 Chief Amos Wegwu Annex Off Alikor Estate . Uniport Road behind Genesis Choba. Description: The hotel is 1km away from the University of Port Harcourt. Address : It’s inside Uniport Teaching Hostel . Address: The hotel is located at Alakahia junction opposite UPTH. Description: When you come out of the street, you go across the road and take a shuttle to Abuja Campus. Hope this will help and we wish everyone a safe trip to and from Port Harcourt, Rivers state. The National Junior and Youth trails which is tagged D. K Olukoya Championship was initially billed for the 7th and 8th of April at the High Performance Center, Uniport but was postponed to Monday 10th April because of the NUGA prelims which was held at the same venue. The Athletics Federation of Nigeria (AFN) has thought it wise to consider the student-athletes who are currently writing their SSCE exams and so therefore the D. K Olukoya competition has been postponed to a further date that is yet-to-be decided. With that been cleared, the AFN has decided to go on with the All Comers which was meant to be done on the same day as the Youth and Junior championship but will now hold on Wednesday, April 12th at the same venue and it’s open to Senior athletes but Junior and Youth athletes who are free (not writing exams) can also compete at the competition. In our next article we will give a list of hotel accommodations around the competition venue.